Home Blog Will Lifting Weights Make Me Bulky? “I don’t want to get bulky” is a phrase that every personal trainer has heard before, particularly from women that fear that they will adopt a “manly” physique if they get involved with a program that bases around weight-lifting. Women often think that they’re going to turn into Arnold Schwarzenegger with a wig on if they start doing bench press, squats and curls. The reality is that they couldn’t achieve this physique naturally even if they tried. Think of it this way. Men have a lot more testosterone than women. This is a biological fact. Testosterone is an androgenic hormone responsible for various masculine traits (think body/facial hair, muscle growth, deeper voice). According to the National Institute of Health, the normal testosterone range for men is 300-1000 ng/dL (nanograms per deciliter). The normal testosterone range for women is only 15-70 ng/dL. Women, conversely, have significantly higher estrogen. Now estrogen does contribute to an increase in GH (growth hormone), but it also increases SHBG, which directly diminishes the amount of free testosterone for women. Additionally, estrogen increases cortisol, which reduces muscle mass. Biological science now accounted for, most men still have trouble putting on muscle mass naturally through rigorous training with weights. For women, it is even more difficult because of the significant difference in testosterone. 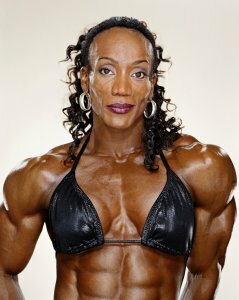 Any women you see that have “manly” physique are almost undoubtedly on some combination of drugs, steroids, insulin, or HGH. Take a walk inside a gym and look at the difference between the cardio section and the weight room. Generally, and obviously, there are exceptions, most women working out in the gym will be in the cardio section, whereas most men will be lifting weights. However, you will often see a few women lifting weights. Those women generally have better overall physiques, because they generally understand their bodies better and the effect that weightlifting can have on them. 1. You will burn more calories, as well as more body fat. Cardio has always been the go-to for both men and women when trying to burn calories and reduce bodyfat. However, the burning process only takes place as long as you are partaking in that cardio session. The process of resistance weight training and building muscle keeps your body burning calories and fat throughout the day. Our suggestion will always be to combine cardio and resistance training for optimal fat burning and calorie reduction. 2. Get that toned, defined look you’ve always wanted. As previously mentioned, women have difficulty building muscle mass because of low testosterone. What does this mean? It means that the outcome from resistance training will be muscle toning. Lean legs and arms, trimmed stomach, and curves in the right places are what you can expect from exercising with weights. 3. Gain strength. Not much to explain here. You will get stronger the more weight you lift, which obviously has various applications in the real world. 4. Prevent injury. By strengthening muscle, you’re not only protecting the muscle from injury, but you’re protecting the joints and bones the muscles surround. Maintaining good form keeps from injury in the gym, while the effects of your weight training prevents injury outside of the gym. 5. Feel empowered. This occurs in two ways. First, the act of weightlifting in itself releases endorphins, essentially a feel-good hormone that reduces stress as well. Second, the confidence you’ll receive from achieving the results you desire improve self-confidence, attitude, and quality of life. So ladies, now is the time to stop fearing the gym because you imagine yourself turning into the she-hulk after you lift your first dumbbell. Find a consistent program and you could be looking and feeling your best in no time!